I guess there’s a reason I’ve never heard anyone talk about this movie, let alone see it. It seems to have been deliberately buried in the filmography of William Friedkin. His back-to-back hit films The French Connection and The Exorcist are legendary. Even his remake of Wages of Fear in 1977, Sorcerer, though not available on DVD or Blu-ray, is a cult hit film, revered by those who know and appreciate it. Hell, even Cruisin’ (1980), the controversial serial killer film set in the gay underworld of NYC, got a decent DVD re-release a couple of years ago. The Brink’s Job fits right in between Sorcerer and Cruisin’. It’s a ‘caper comedy’ like The Sting or The Great Train Robbery, in which the job of crime is made fun by the dandy personalities of its lead characters, the nostalgic time period (in this case, the 50s) and the overall desire for audiences to see working class Joes ‘stick it to the man’. 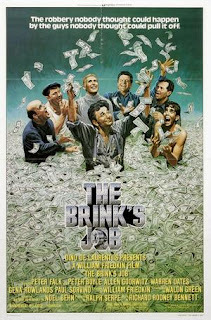 Unfortunately, The Brink’s Job is so light, fluffy and unmemorable, I now see why it’s only a blip on Friedkin’s radar. Peter Falk plays Tony Pino, a career criminal in Boston, Mass., who is caught and sent to prison for burglary. When he gets out, his attempts to go straight don’t last too long, and soon his need to steal returns in full force when the sight of the large sums of money being loaded into a Brink’s truck throws him off the wagon. His first job seems so easy – lifting some money bags from the back of a number of trucks with ease. When this job doesn't make it to the press, the idea pops into Tony’s head that the negative publicity of such a robbery would look bad for the bank's reputation. Thus, they scheme to steal even more money from the falsely impenetrable Brink’s bank. After staking out the joint, Tony and his hoodlum colleagues systematically break in and take ‘em for everything they’ve got. It’s only after the job that loose tongues and internal jealousies compound and threaten to implode the whole affair. Though the film is based on a true story, once called “The Crime of the Century”, the normally tough writer Walon Green (Sorcerer, The Wild Bunch) turns in a script so slight and undramatic that there’s little, if any, stake for the audience or the characters in these crimes. The tone established is so light and fun, there’s almost no threat whatsoever to these characters. At every turn, the jobs Tony pulls have minimal suspense. It requires little effort for him to steal from the trucks, and his numerous break-ins to the Brink’s building are executed with such ease that all tension is nullified. Unless you count Peter Falk’s goofy, lazy-eyed antics as funny, other than some silly slapstick from Allen Garfield, the film is a comedic dead zone. The robbery in this film is the absence of Friedkin’s recognizable robust streetwise style. Though production values are handsome, there’s no edge or semblance of suspense. Hell, not even a chase scene of any kind.